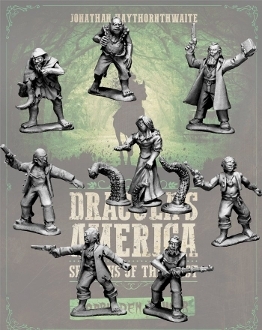 The Church of Dagon is made up of 8 figures: 1x Priest of Dagon 1x Emissary of Dagon 1x Tentacled Hybrid 1x Scaley Hybrid 4x Cultists of Dagon (3 with pistols, 1 with rifle). All miniatures are 28mm sized. Metal figures, supplied unpainted.